Before you leave your comments, let me say it for you: "Man, would that picture have been so much better if I had artfully arranged some cilantro sprigs on top of the salad." You know the drill on why this didn't happen, because it's happened to you. I'm at the store buying ingredients for dinner, and I KNEW I had a bunch of cilantro at home. Of course upon arriving home I find that there was no cilantro anywhere to be found, but I'll be damned if I'm going to go pack C-boy back out to the car, run to the store and fight the after work crowd, just so my f*cking picture turns out better. I may be a bit obsessive about taking pictures of my food, but I'm not THAT crazy! So there ya have it. In any event, even without the visually pleasing, but unnecessary to the enjoyment of, cilantro, this bright tasting cucumber salad was delicious. A perfect accompaniment to the cod with two sauces I served with it (that freakishly good..and easy...recipe tomorrow). 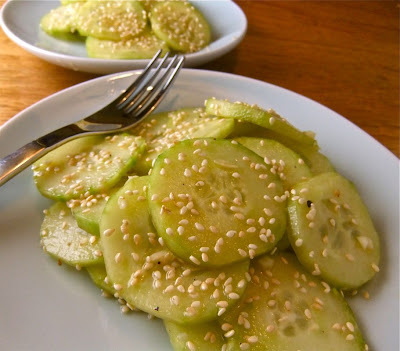 It received the highest compliment from w, who said it tasted similar to the cucumber salad her dad makes (and w's dad is not to trifled with in all things Asian-flavored). Its cool, fresh flavors played off the spicy, full-flavored fish dish perfectly, and took all of about ten minutes to throw together, not counting the hour it sits in the fridge where the magical flavor melding happens. Try it out, you'll be impressed! Stir together first 7 ingredients in a large bowl. Add cucumbers, tossing to coat. Cover and chill 1 hour. Using your hands, place on salad plates, letting excess dressing drain off into bowl before plating. Sprinkle sesame seeds on top. Serve immediately.